I only have two weeks left here so I'll try to cram in the last DROPs that I've been planning. 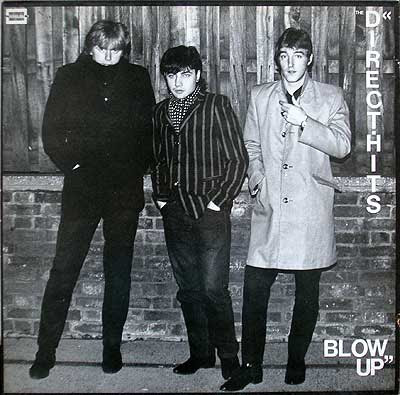 Here's a track from the sadly forgotten mod pop group The Direct Hits that were signed to Dan Treacy's Whaam! label in the early 80's. Colin Swan was previously in a band called The Exits, and Rev-Ola recently released a compilation with that band. But their music is reportedly more in the new wave style - I've not heard it but according to The Brogues it's not that great. After The Direct Hits Colin was in The Happy Breed and now has a band called The Cult 45s, in case you're interested... During their time together the Hits released one single and one album, that has since become legendary and are almost impossible to find. This song however, is from a Japanese compilation of outtakes and live recordings. It came out in 2004 and is called Modesty Blaise! - I think it's a bootleg. There's also another similar cd of what was supposed to be their second album. "Ordinary Girl" is a great example of their very classic pop songwriting. I'm sure The Exits will find a wee place in loads of peoples' hearts ... it's just that I can't stick Elvis Costello (I get in a right grump when they play his stuff at National Pop League!) and they remind me of him. Bleurgh! The Direct Hits sound much more to my taste, though! I love Direct Hits, thank you so much for featuring them. Have you heard Blow Up? It's a shame that your show isn't on anymore, it would have been great to hear it. I hope you're enjoying your adventures in Sweden!